In spring 2015 I launched an internal initiative named Project Copyscale to determine whether it was possible to automate content creation with artificial intelligence. Specifically, I wanted to figure out, could we use machines to write blog posts at scale? The idea was inspired by a SXSW session I attended that year featuring the managing editor of the Associated Press and the CEO of Automated Insights, a company that uses a form of artificial intelligence called natural-language generation (NLG) to create content. The presenters shared how the AP went from publishing 300 earnings reports per quarter written by humans to 3,000 per quarter written 100% by machines using Automated Insights technology. The implications to content marketing, in my mind, were immense. Since that time, my agency, PR 20/20, has implemented NLG to produce Google Analytics reports (reducing analysis and production time by more than 80%), and has begun building pilot programs to automate data-driven premium content. Along the way, we launched the Marketing Artificial Intelligence Institute to tell the story of AI through the technology leaders building the solutions and the marketers who are using AI to evolve their businesses and careers. What we’ve learned has altered my view of what’s possible today and in the years ahead. Consider how much time your team spends discovering keywords; planning blog post topics; writing, optimizing, personalizing, and automating content; testing landing pages; scheduling social shares; reviewing analytics; and defining content strategies. Now imagine if a machine performed the majority of those activities and a marketer’s primary role was to enhance rather than create. Machines are not going to replace content marketers in the near term, but artificial intelligence is accelerating us toward a more intelligently automated future. Artificial intelligence is a broad term that refers to the technologies and processes of making machines smart, which in turn augments human knowledge and capabilities. This includes increasingly popular terms such as machine learning, deep learning, image recognition, natural-language processing, and cognitive computing. Artificial intelligence may seem like a futuristic concept, but its use is widespread among companies we interact with daily. Netflix employs AI to recommend shows. Amazon uses it to power Alexa and create personalized online experiences for shoppers. UPS applies it to determine optimal delivery paths for its 55,000 daily routes around the world. Tesla powers its Autopilot autonomous-driving feature with deep learning. Facebook uses image recognition to identify faces in photos and machine learning to filter newsfeeds. Google’s RankBrain algorithm drives search results. And, Apple uses natural-language processing to recognize questions and provide answers with Siri. At its core, AI is powered by data and algorithms that enable machines to learn and evolve on their own. In traditional software, humans write algorithms or sets of instructions that tell a machine what to do. For example, in marketing automation software, a marketer may instruct the machine to send a three-part email campaign once someone downloads an e-book. In isolation, this is a relatively simple task for a human to plan and perform. But, what if there are 10,000 e-book downloads, across five personas, originating from multiple channels (social, paid, organic, direct) that require personalized emails and website experiences based on user history? No human brain is wired to solve that challenge and no existing software is optimized to visualize all the possibilities. This is where AI excels. It takes specific and complex data-driven problems, then devises and executes solutions. Think about all the data flooding in from social media, CRM, sales, advertising, remarketing, e-commerce, and mobile. Every source offers valuable information, but humans have a finite ability to process that data, build intelligent strategies, create content at scale, and achieve performance potential. Artificial intelligence, in contrast, has an infinite ability to discover insights, deliver predictions, make strategic recommendations, and create content better, faster, and cheaper. 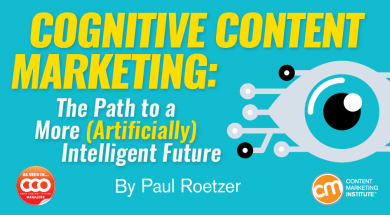 While the content marketing AI space is in its infancy, there are dozens of emerging AI-powered tools built to help marketers plan, create, optimize, personalize, promote, and measure content more effectively and efficiently. The key thing to know about AI is that it is largely intended to augment human knowledge and capabilities, not replace them. What can content marketers do? First, evaluate repetitive, manual marketing tasks that could be intelligently automated. Research the AI capabilities of your existing marketing technology stack, such as your automation and CRM platforms, and explore the potential of AI solutions dedicated to specific content marketing needs through a technology marketplace like G2 Crowd. Second, assess opportunities to get more out of your data – discover insights, predict outcomes, devise strategies, personalize content across channels, and tell stories at scale. Consider the free version of IBM Watson Analytics as a gateway to begin exploring data in new ways. And, finally, gain a competitive advantage through constant learning. You are not alone if you feel overwhelmed and confused by AI and all its related terms. Be deliberate in your efforts to consume articles, blog posts, podcasts, presentations, reports, and books on the topic. Now is the time to begin learning about the present and future potential of artificial intelligence, and connect with AI-powered technologies that can drive marketing performance and transform your career. As the applications for AI in marketing become more compelling, technology companies are racing in to meet the need. Below are some of the top tech companies in the marketing AI space, as well as some examples of their work. Adgorithms uses predictive analytics “to execute on data-driven actions, and deep learning technology to act effortlessly on unpredictable situations that would traditionally require decision-making and reasoning by a human marketer,” explains Or Shani, CEO of Adgorithms. Harley-Davidson NYC uses Adgorithms to optimize its ad spend in New York City. The software helps the brand isolate and target a narrow audience in a crowded market across channels. Automated Insights leveraged its success with the Associated Press and other enterprises to build the industry’s first do-it-yourself natural-language-generation platform. 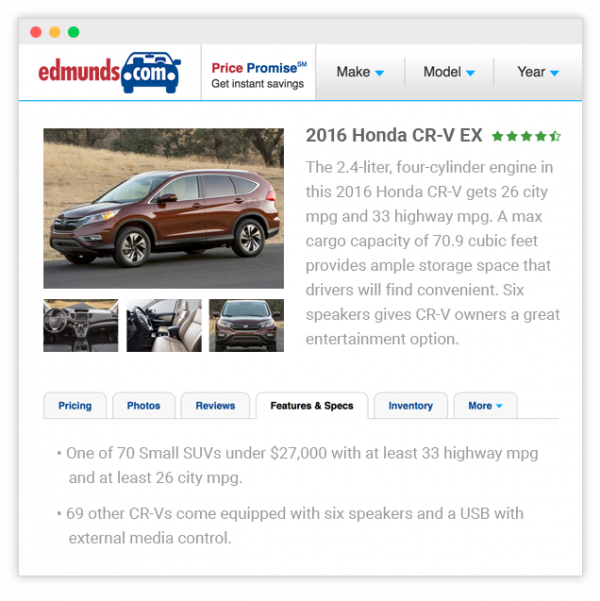 Car shopping website Edmunds uses Automated Insights’ software to continuously update content on its website, where thousands of pages of detailed vehicle profiles are written based on manufacturer data. 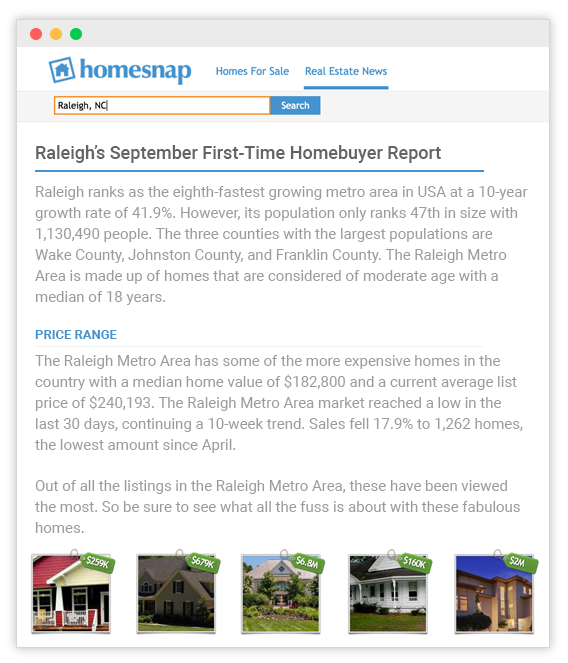 Real-estate website Homesnap publishes individual listings supplemented by AI-created community profiles – all automatically generated based on publicly available demographic, crime, and property value data. Boomtrain uses machine learning and predictive algorithms to drive increased clicks, engagement, and revenue through customer communication. It helps companies serve content that’s most likely to engage an individual reader, and delivers it through multiple channels in real time. Its customers – including Forbes, CBS, Chow.com, The Onion – are primarily in the publishing, travel, and e-commerce verticals. OneSpot personalizes content across digital channels for big brands like L’Oréal, IBM, Whole Foods Market, and Delta Faucet. OneSpot helps Nestlé serve hyper-personalized content for readers in real time, plus it feeds intelligence back to Nestlé about how users interact with the content – all put to use in rapid-fire decision-making about marketing spend and editorial focus. Narrative Science’s natural-language-generation software, Quill, helps companies like Groupon, MasterCard, and Franklin Templeton Investments convert data into stories – these stories inform everything from decision-making to employee productivity and customer experience. USAA uses Quill to drive member engagement through automated custom narratives. Deloitte leverages natural-language generation to innovate anti-fraud, anti-money laundering, and anti-corruption practices. Credit Suisse includes automated narratives in its investment-research platform to enhance visualizations with insights. The company’s cognitive content platform “arms organizations and individuals with smart content that maximizes the efficacy of communication with any audience at scale, while delivering unique insight into the specific triggers that drive action.” In a sign of its success, Persado counts dozens of top companies among its roster, including Neiman Marcus, Angie’s List, Expedia, Zipcar, and Verizon. Artificial intelligence can be intimidating, but it does not have to be. You do not need to understand how it works to comprehend what it is capable of achieving. It is still early. Many of the rising AI tech companies have significant venture-capital funding but limited market success to prove that the products work and the models are scalable. While there have been tremendous advances in AI capabilities, most marketing solutions are narrow in application and require tremendous amounts of human time and guidance to deliver on the value promised. Artificial intelligence requires massive amounts of data (structured and unstructured) and customized solutions, so large enterprises are more likely to see short-term benefits from AI investments. There is a push to make AI technology more affordable and accessible. As companies like Facebook, Google, Microsoft, Amazon, and IBM continue to open up their AI technology, more businesses will explore the possibilities. The challenge will be finding technical talent capable of building and executing AI solutions. Get more AI examples and insights in the e-book Artificial Intelligence and the Future of Content: A Guide for Marketers (included as slides below). A version of this article originally appeared in the April issue of Chief Content Officer. Sign up to receive your free subscription to our bimonthly, print magazine.